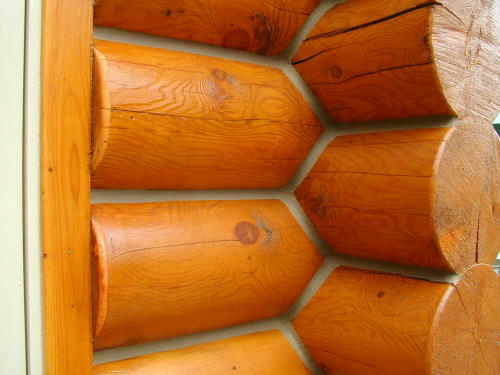 There are many types of corner systems used in log home wall connections. Basic requirements for any corner joinery are: to provide structural integrity of whole log home construction, to avoid air infiltration, and to meet taste of future home owner. Most popular are: Saddle notch, Scandinavian notch, Dovetail. Saddle notch is not just some particular notch type, this is a family of notches. Notches of this family can differ in shapes and look one from other. In North America compression fit saddle notch is very popular. 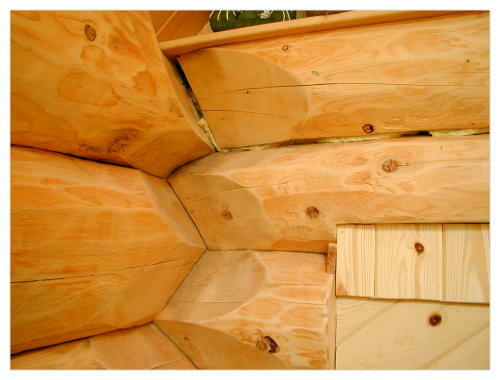 The compression-fit notch come to North america from Scandinavia via Canada thanks to the reinvention of an ancient Norwegian log building technique by Del Radomske, a Canadian log home builder, inventor, teacher, and author. 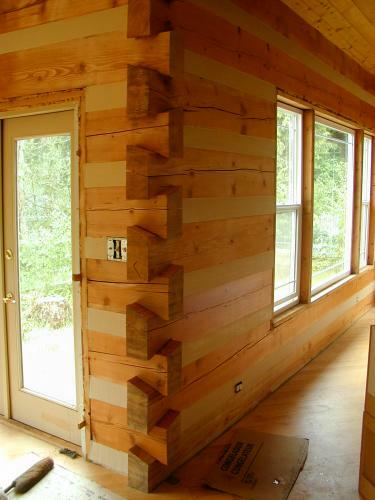 And now the notch is very popular among log home builders of other regions of the world. The compression-fit notch, sometimes called shrink-to-fit, is designed to get tighter as the logs settle and shrink. 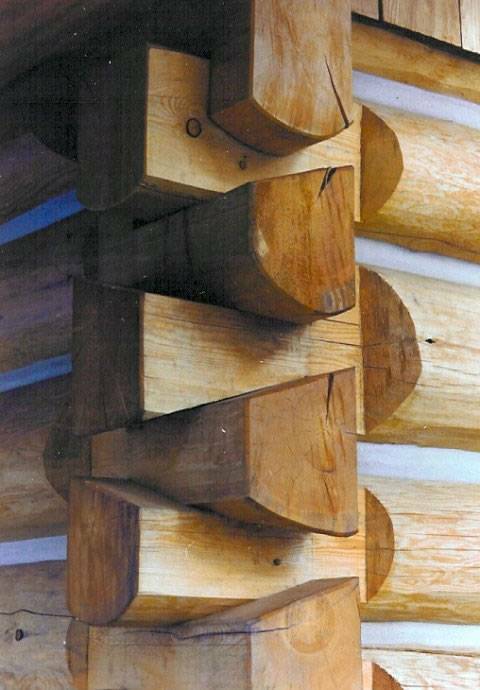 This notch usually is used in handcrafted log homes and it is combined with chinkless (full scribe) method of longwise log interlocking. Compression fit saddle notch is used rarely by companies utilizing milled logs because machines which are able to produce such notch are very expensive. Logs shrink mostly in diameter, so properly made shrink-to-fit notch should prevent appearance of gaps since each log supposed to get closer to log under, over the time because of shrinking and compression. However it's not always true, in some cases after few years chinkless log walls with Canadian notches in corners should be chinked since gaps can appear couple years later. In order to prevent gaps in notches many handcrafted masters use overscribe method. In first couple years logworks built using this method will have small (1/4") gaps between logs (air infiltration is prevented by insulation) however in 1-3 years all gaps will be closed and logworks will become tight and nice. Scandinavian notch (also known as Norway's notch) is one of most labor intensive (complex), effective and nice looking notches. 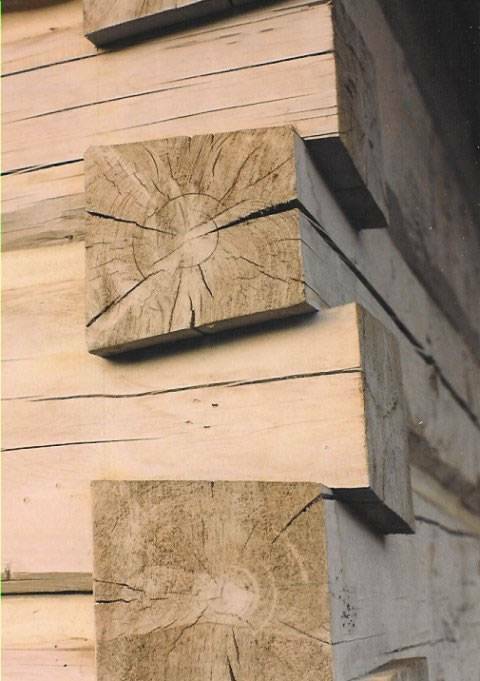 In Scandinavian countries it’s usually used with bevel edge logs (timber) however it is possible to cut Scandinavian notch on logs with round profile. Similar to compression fit saddle notch, the Norway’s notch belongs to “shrink to fit” kind of notches. 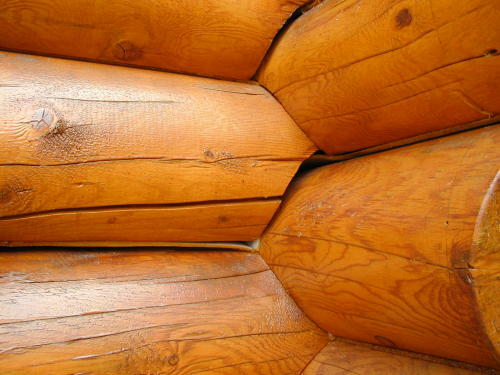 Small number of North American handcrafters practices this notch, usually they prefer compression fit saddle notch, described above, however in Norway, Finland and Russia this notch is number one choice for high-end-priced log homes. Other style of saddle notches is a Round notch also known as saddle cope. A Round notch is made by simply cutting the exact contour of the log below into the bottom of the log going above it. In Russia and other European countries this notch is very popular. The round notch (or its variations) is used as by handcrafters as well as in the construction of manufactured homes since the notch can be easily made by a machine or log lathe. Downside of this notch is that sometimes it may not stay tight after srinking. Even if the logs are kiln dried they are still going to shrink and log home will need to be caulked. So in period of 2-5 years after the home has been built, settled and logs have reached equilibrium, the owner of the home may need to consider performing of second caulking or chinking. 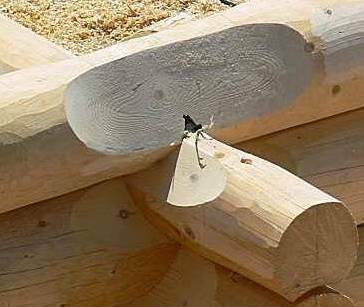 Overscribe method is also applicable to Round notch and many log home builders use this method in order to eliminate downsides of the notch. 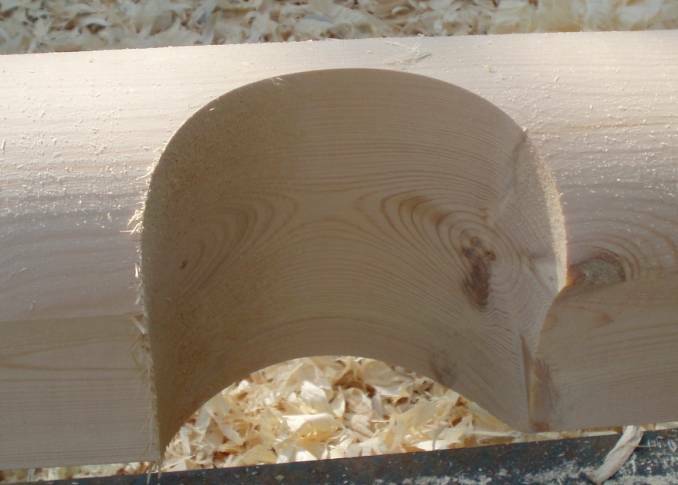 Companies utilizing milled logs with tongue & groove profiles usually do not use overscribe principals. Dovetail notch is popular among as handcrafters as well as milled log-home manufacturers. 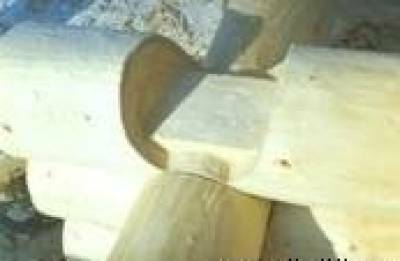 Chinking or chinkless longwise joinery, squared or round profile logs can be used with Dovetail notch. Functionally, Dovetail Corner Notch joinery is superbly suited to house construction. Each log end is first cut in a shape resembling the tail of a dove, then as the logs are stacked and fitted, the dovetails securely interlock. The result is both strong, durable, and presents the eye with an aesthetically pleasing symmetry. One of advantages of dovetail is that it allows using efficiently full log length, in other words no need to spend log length for flyways (overhang or shoulders). 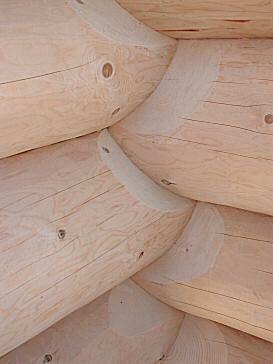 This old pioneering technic lets building log homes without doing of any notching in corners at all. All connections are made by rebars or log screws. 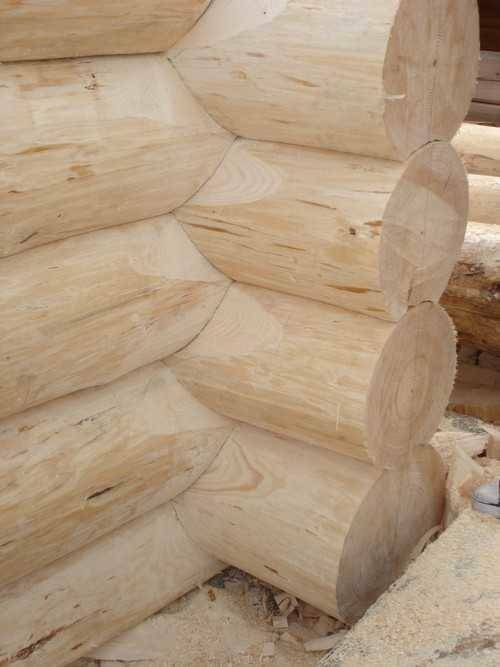 Properly made log home used this method do not sattle although logs shrink, therefore chinking is required for this type of joeinery if natural logs or giant dowels are used. 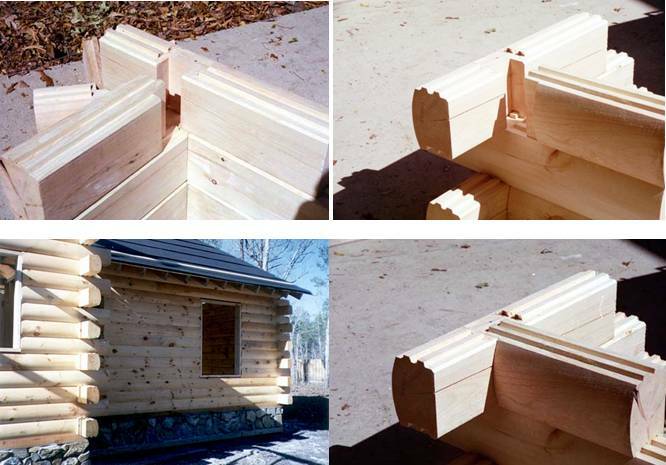 Log home kit manufacturers modified this method and produce homes which do not require chinking. Click here to see examples of milled but & pass corners.